Transportation Note: For the East Side museums, the best thing to do is start at the Neue Galerie (Fifth Avenue and 86th Street) and take the Fifth Avenue bus downtown to the other museums. They are never more than a few blocks away from a bus stop. It would require a lot of endurance to do all the East Side museums in one day; it’s possible, but not desirable. Warning: their website can be very slow sometimes. Admission: $15 General; $10 Students and Seniors. The museum is free from 6 - 8 pm on the first Friday of every month. Photography is only permitted on the ground floor and lower level of the building; you are not allowed to enter the museum with bottled water - they make you throw it away! The Neue Galerie is devoted to early twentieth-century German and Austrian art and design. 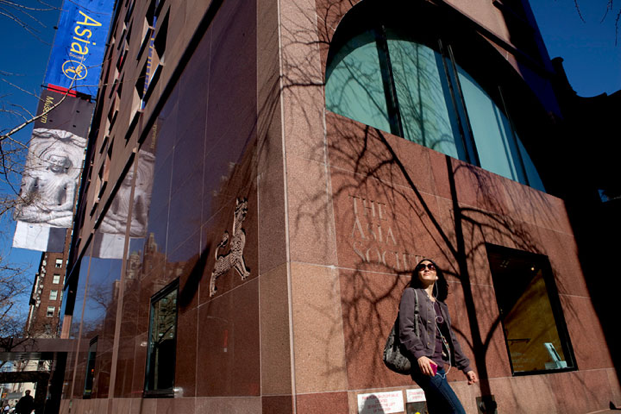 It is relatively new -- they opened on November 16, 2001 in a converted Fifth Avenue mansion, the former William Starr Miller House, a Louis XIII/Beaux-Arts structure. Happily they kept many of the historic details of the Miller House and added architectural and design elements from early twentieth-century Vienna. In addition to the museum, they also have a bookstore, design shop, and two Viennese cafés: Café Sabarsky and Café Fledermaus. The Neue Galerie cafés are an important part of the experience of this museum. They are modeled after the Viennese cafés that served as important centers of intellectual and artistic life at the turn of the century and are outfitted with period objects including lighting fixtures by Josef Hoffmann and furniture by Adolf Loos. Viennese food is their specialty, and it’s superb, especially their pastries such as strudel and Linzertorte. There are usually long waits to get in, but it’s well worth it, especially Café Sabarsky. that aims to: reveal a common thread running through the fine and decorative arts in turn-of-the-century Vienna: the redefinition of individual identity in the modern age. The show explores the newly-evolving attitudes about gender and sexuality, and it's especially interesting in that it includes clothing, accessories, and even a pornographic movie of the period. This Schiele is actually one of the tamer drawings in the exhibition — after all, this is a family blog! 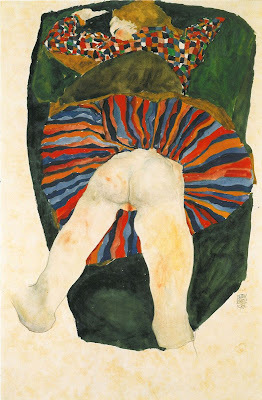 Schiele, like many of his fellow artists, pushed the boundaries of what was permissible, and he was convicted for displaying indecent images where minors could have viewed them. This was a lesser crime than what he was originally accused of: kidnapping and sexually molesting a a fourteen-year-old girl who ran away from home and sought refuge with Schiele and his model Wally Neuzil. 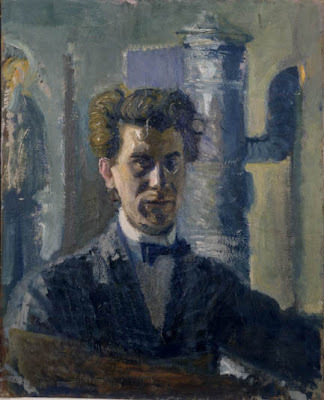 One of my favorite works in the show, and it’s part of their permanent collection, is a self-portrait by the little-known Richard Gerstl. Little-known because Gerstl, at the age of 25, after a disastrous love affair with Schönberg’s wife, killed himself and destroyed most of his work. Fewer than 100 pieces survive. And for Gustav Klimt lovers, I counted 10 paintings in the exhibition, many major ones, and 12 drawings. Hours: Tuesday - Saturday, 10:00 am - 6:00 pm; Sundays, 11:00 am - 5:00 pm. Admission: $18 General; $15 Seniors; $10 Students. Pay what you wish Sundays 11:00 am - 1:00 pm. The Frick is simply the BEST small museum in the country -- maybe the world! 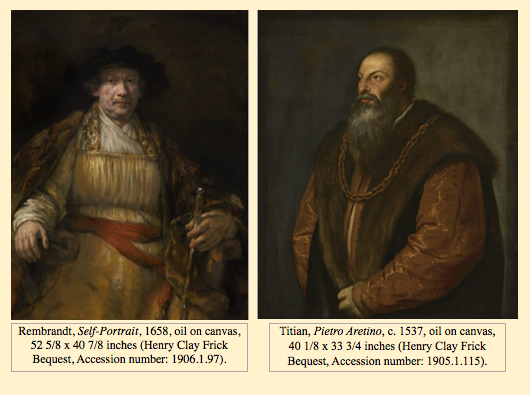 Visiting the Frick is like walking through the pages of Janson’s History of Art (is this still used for Art History Survey classes?). They have some of the best art, by some of the best European artists, displayed under the best conditions — installed in the Henry Clay Frick mansion. The only problem is that people have found out about this treasure so it can get crowded. It's best to get there when it first opens. 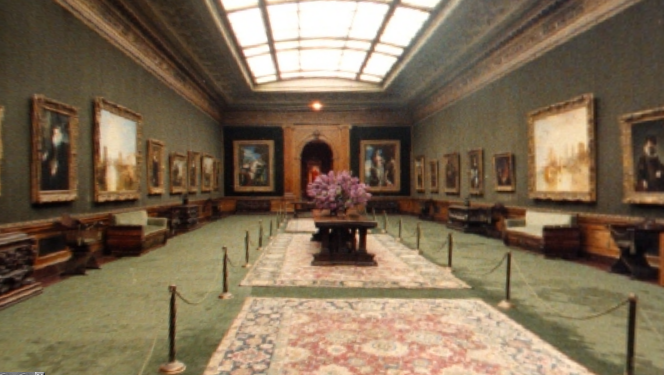 Screen shot of the Living Hall from the Frick virtual tour. 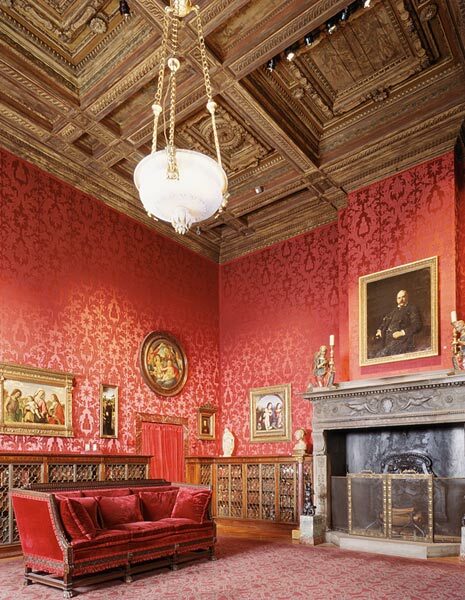 Screen shot of the West Gallery from the Frick virtual tour. Okay, these paintings are almost silly in their romanticism, and I think Rembrandt at least was having some fun with the idea, but they’re also two of the great painterly paintings in the country. 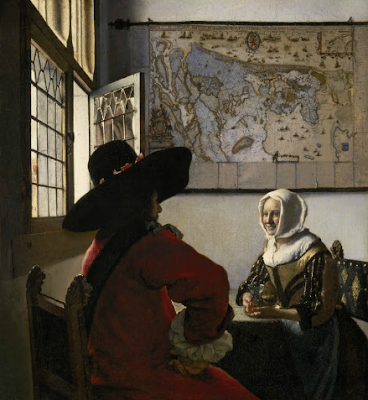 Johannes Vermeer, Officer and Laughing Girl, c. 1657, oil on canvas (lined), 19 7/8 x 18 1/8 in. (Henry Clay Frick Bequest, Accession number: 1911.1.127). Piero della Francesca, St. John the Evangelist, c. 1454-1469, tempera on poplar panel, 52 3/4 x 24 1/2 inches (Purchased by The Frick Collection, 1936, Accession number: 1936.1.138). Tip: Most of the time you’re allowed to sit on some of the plush chairs in the Living Hall, a peaceful and intimate room even when the museum is crowded. I love to doze off there because, for a few seconds after I wake up, I feel like I’m in paradise. Hours: Tuesday - Sunday, 11:00 am - 6:00 pm. Admission: $10.00 General; $7.00 Seniors; $5 Students; free for persons under 16. Admission is free on Fridays 6:00 pm to 9:00 pm. Photography and electronic recording of any kind are not permitted anywhere in the building. The museum is an uninteresting modern building, but at least it doesn’t intrude on the art. 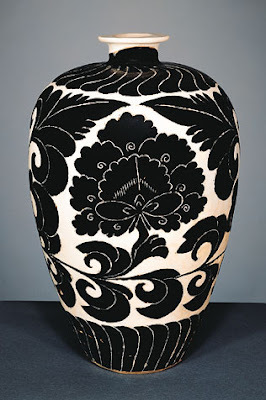 Their claim to fame is the Mr. and Mrs. John D. Rockefeller Collection which is considered one of the great collections of Asian art in the United States even thought there are fewer than 300 pieces. Bottle, North China; Northern Song period, 12th century, Stoneware with sgraffito design in slip under glaze, 12 1/2 x 8 1/2 inches (Mr. and Mrs. John D. Rockefeller 3rd Collection of Asian Art, number 1979.141). Unfortunately, the Rockefeller Collection is on view only occasionally, and most of the time they have exhibitions of mildly interesting videos and new-media art by contemporary Asian and Asian-American artists. About half the total exhibition space is now taken up with an exhibition of photographs -- 227 relatively large ones, hung salon style, that the popular contemporary Chinese artist Ai Weiwei took from 1983 - 1993 when he was living in the East Village. The photographs are interesting for its documentation of that period, but they are little more than snapshots blown up, except maybe from 1990 onward where Ai Weiwei seemed to be exploring the medium a bit more. The museum is in the process of installing a long-delayed exhibition of Buddhist art from Pakistan (opens August 9th). Admission: $15 General; $10 Children, Seniors and Students. Free on Fridays, 7 pm - 9 pm. Photography is not allowed except for the ground-floor public spaces. The old Morgan Library and Museum, before the 2006 Renzo Piano expansion and renovation, was a Mecca for connoisseurs of drawing. Almost every time I went I would overhear educated and intelligent discussions about the drawings on view. Not anymore. What’s surprising is I don’t think attendance has increased since the renovation, at least not in my experience. I don’t know the numbers, but the place sure looks empty every time I’ve been there. 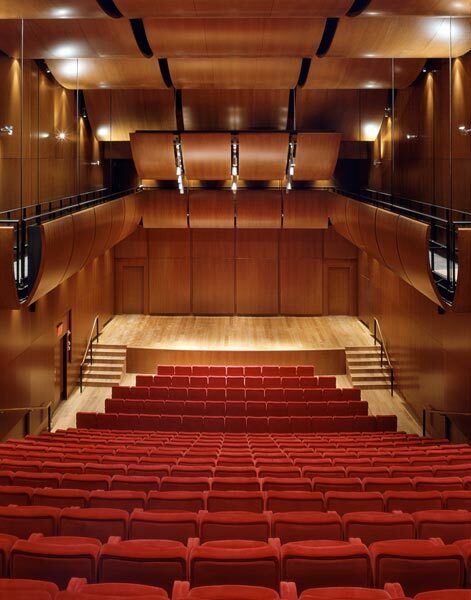 The Renzo Piano expansion and renovation added a lot: a nice welcoming entrance on Madison Avenue, two restaurants, greater handicapped accessibility, a beautiful new performance hall (see photo below), a better reading room, and better storage for the collections. Gilder Lehrman Performance Hall, The Morgan Library & Museum. They claim to have doubled the amount of exhibition space, but it really doesn’t seem like that. In any case, typical of museum expansions in the last few years, there’s a lot of what I think of as wasted space — space devoted to a soaring glass atrium, an expansive lobby, a large museum store and two (!) restaurants. MoMA is the prime example, but it’s also true of most other museum expansions. The Morgan Library & Museum’s new lobby. 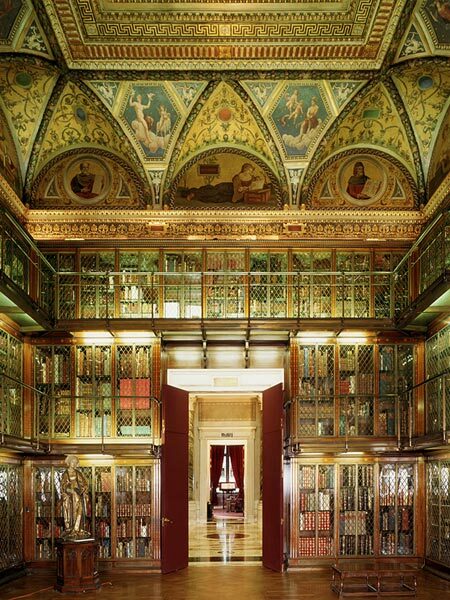 Do not not miss seeing the original Morgan Library. Even though it's connected to the modern addition, it’s a little hard to find. Ask one of the guards for directions. The Library is a palazzo-like structure built between 1902 and 1906. It was designed by Charles Follen McKim to serve as the private library of financier Pierpont Morgan, and it's pretty spectacular. 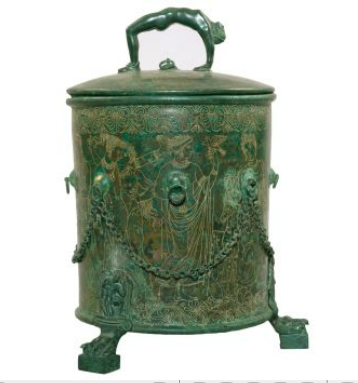 Etruscan Cista with cover, c.300 B.C., Palestrina, Bronze, Height (from foot to top of handle lid) 14 1/4 inches; diameter (at top of cylinder) 8 11/16 inches; (at base of cylinder) 8 1/8 inches (Purchased by Pierpont Morgan, 1907; AZ046a-b). 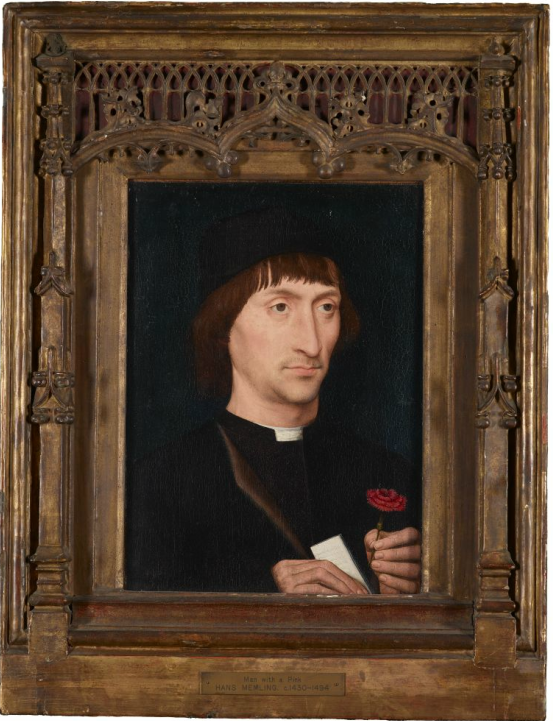 Hans Memling, Portrait of a Man with a Pink, ca. 1475, Tempera on panel, 10 3/4 x 15 inches (Purchased by Pierpont Morgan, 1907; AZ073). Pietro Vannucci, called Perugino, Madonna and Saints Adoring the Christ Child, ca. 1500, Tempera on wood, 34 1/2 x 28 3/8 inches (Purchased by Pierpont Morgan, 1911; AZ066). the sole surviving manuscript of John Milton's Paradise Lost, transcribed and corrected under the direction of the blind poet; Wolfgang Amadeus Mozart’s "autograph manuscript" of the Haffner Symphony; Charles Dickens's manuscript of A Christmas Carol; Henry David Thoreau's journals; Thomas Jefferson's letters to his daughter Martha; and manuscripts and letters of Jane Austen, Charlotte Brontë, Lord Byron, Wilkie Collins, Albert Einstein, John Keats, Abraham Lincoln and John Steinbeck. Wonderful--and welcome--reminders of art's past. I remember my first visit to the Frick, I felt as though I'd been personally invited, as I was about the only one there, and I came away with the impression that all historical works of art were masterpieces. In later years, I'd periodically stop in when I felt the need for a break from the cacophony of the art's contemporary situation.